George Raymond Wagner (1915-1963), better known by the nom de guerre Gorgeous George, helped sell more television sets in the late 40’s/early 50’s than anyone this side of ‘Uncle’ Milton Berle . 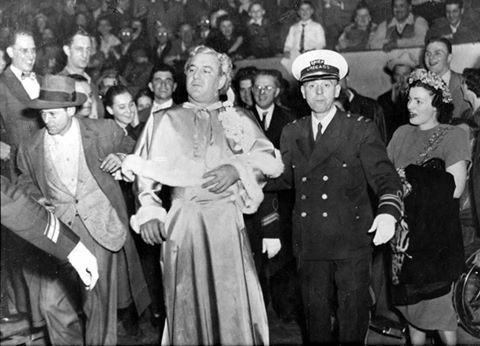 Professional wrestling was on the airwaves six nights a week, on every network, and Americans were clamoring to get a glimpse of the flamboyant antics of the bleached-blonde, sequin-robed “sissy” who grappled like a wild tiger inside the squared circle. 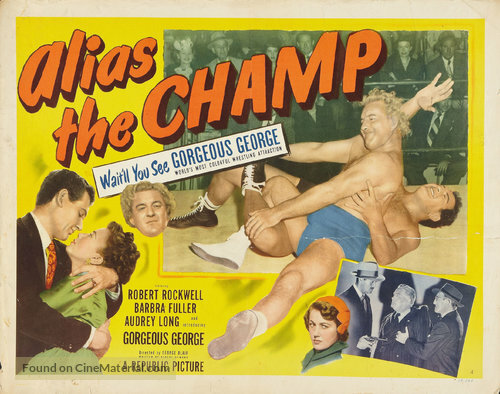 But TV sets were over many an Average Joe’s budget back in those days, so Republic Pictures took the opportunity to strike while the iron was hot, signing “The Toast of the Coast” to star in his own movie, 1949’s ALIAS THE CHAMP. This entry was posted in Film, Film Review and tagged Alias the Champ, Cracked Rear Viewer, Gary Loggins, Gorgeous George, pro wrestling, Republic Pictures, Sam Menacker, Through the Shattered Lens, Tor Johnson, Wrestlemania, wrestling. Bookmark the permalink.